A Middlesex University Film student has got her career off to a flying start - by making a documentary about a cutting-edge agricultural project. Elvina Neva, 22, focused her final year project on an innovative underground farming initiative. Vegetables are grown hydroponically in abandoned sections of the London Underground tunnel network, deep below Clapham. The farming project, called Growing Underground, was the brainchild of a previous Middlesex University Film graduate, Richard Ballard. Elvina originally started filming the project when it was in its infancy; but it has since taken off, supported by a highly successful crowdfunding campaign and backed by top chef Michel Roux, Jr.
As Elvina explained, the rapid development of the project brought its own challenges to filming: "Hydroponic cultivation has become really big news in the last 18 months. When I first decided to cover Growing Underground, no one knew about it at that time. "Since then, some really big media companies have picked up on it too, so I've needed to work even harder to find fresh angles to investigate. That's all part of the challenge though!" 33 Below Clapham from Halfway West Films on Vimeo. There were also practical difficulties to overcome. Elvina and her film crew had to work in isolated, sometimes unnerving conditions, and carry everything from tracking dollies and tripods to cameras and lights up and down a narrow spiral staircase just to reach the location. Elvina explained that while studying Film at Middlesex, she was able to find her own style and develop her inner voice. She continued: "I've really enjoyed my Middlesex experience. The tutors gave me so much support in my efforts to be creative, and were always able to find something positive and constructive to focus on. "The university has great technical facilities, and I was delighted by the freedom were given to use those to create genuinely original work." 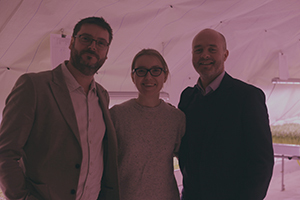 Elvina, originally from Lithuania but now living in East Finchley, London, has started her own independent film production company - Halfway West. She has already been offered a variety of paid commissions, and looks forward to taking these up this summer.